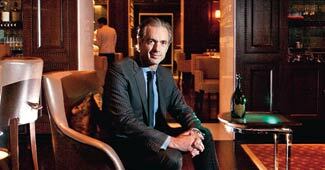 On the top floor of Delhi's recently opened Leela Palace hotel, Daniel Lalonde looks relaxed. The Chief Executive of the champagne division of Paris-based luxury conglomerate LVMH is in India for the first time, and is pleased that Indians are acquiring a taste for champagne. "India is the 27th largest consumer of champagne in the world," he says. "But I believe that in the next few years India can easily reach the top 10." India is doing its bit. A few kilometres south, at the F Bar nightclub, where Lalonde's company has established a Dom Perignon lounge to promote its highend champagne, Indians flush with money visit, often several times a week, and spend upwards of Rs35,000 a bottle on bubbly. And it is not just champagne. A few weeks ago, Radico Khaitan introduced a couple of Japanese malt whiskies, Yamazaki and Hibiki, which until recently were considered an 'exotic' taste. Ashish Khaitan, Managing Director, Radico Khaitan, says that several outlets that bought them have already come back "for seconds and thirds, which is amazing, considering that these whiskies cost between Rs6,000 and Rs10,000 a bottle". Besides fine whisky and wine, Indians have developed a taste for other high-end spirits. Sales of premium vodka brands, such as Belvedere, Grey Goose and Ciroc, are estimated to have doubled last year. Recently, Mexican spirits company Patron introduced its eponymous tequila, with the entry-level Patron Silver priced at Rs7,500 a bottle. "More and more Indians are travelling and studying abroad, and acquiring a taste for different spirits," says John McDonnell, Chief Operating Officer, Patron Spirits. "Many of these people can afford to buy such expensive spirits." Khaitan says that at exclusive parties thrown by wealthy Indians, the types of spirits that are offered to guests have changed dramatically. "And it is not just very rich people. Increasingly, professionals who travel abroad buy spirits from duty-free shops. Twenty years ago, few people bought single malt whiskies. But today, in many home bars, you can see a wide array of spirits, and many of them are imported." No reliable data about sales of imported liquor is available. However, Khaitan estimates that, including the duty-free travel trade, more than 1.7 million cases (a case consists of nine litres) of imported spirits were sold in India in 2010. This year, sales of imported spirits are expected to be 20 to 25 per cent higher. With imported spirits being sold at several times the price of India-made ones, in value terms, India is an increasingly important market for global spirits companies. Just how important? In late August, Diageo, the world's largest spirits company by value, unveiled the latest iteration of its iconic Johnnie Walker Blue Label whisky at The Imperial hotel, New Delhi. The event included a contest for bartenders from across Asia. Diageo flew in nearly 500 guests from around the world for the occasion. At the event, Gilbert Ghostine, CEO, Diageo Asia Pacific, pointed out that India had a long-standing relationship with the Johnnie Walker brand, and was increasingly acquiring a taste for new spirits. "We are launching Ron Zacapa, an aged Guatemalan rum, in the travel channel in India," he said. 'Travel channel' is industry jargon for dutyfree shops. However, the industry is plagued with several issues. Not least among them is the excise duties that Indian states levy on imported spirits sold through retail channels and bars. "While some brands are definitely 'luxury' brands, if duties were brought down it would increase the market dramatically, and I believe tax collections might even improve," says Lalonde. Another critical issue is one that several other industries face in India: a multitude of fakes. In July 2011, the police busted a counterfeit ring operating out of Ghaziabad, near New Delhi, and recovered more than 900 caps and a similar number of stickers of premium Scotch whisky and vodka brands. Earlier in the year, a similar ring, which filled empty bottles of Scotch whisky with blends of cheaper Indian whiskies, was busted. But despite these issues, sales are rising, and rising fast. Business is brisk at the liquor store in Delhi's Select Citywalk mall. Abhishek Singh, a 30-something executive with an IT company, walks out with a bottle of imported Scotch. "I'm having some old friends over tonight, and we want to have a good drink, and frankly, with close friends, you want to drink well," he says. As more and more Indians wish to "drink well", the country will continue to attract international spirits companies. The Indian spirit aficionado has never had it so heady.